MaxMySpeed? MaxMyPC? MyCleanPC? How about InfectMyPC! This will not "max your speed" at all. If you are not familiar with computers and software, then you may not be familiar with the good, the bad, and the ugly. They say, “knowledge is power” – once you familiarize yourself with “the bad” and “the ugly” (spyware, viruses, malware, trojans, worms, adware, etc) you’ll be far less likely to fall for any of it, because you’ll know when it’s a scam. In the meantime, however, there are countless promises of miracle programs that will solve any problem. Some of the best programs are small, generally unadvertised, and free. When it comes to computers, you can’t fall back on the sensible solution of “if it sounds too good to be true…” . If you are not aware of what can’t be done quickly and easily, then you won’t know what is an impossibly good promise. When you see commercials on TV advertising sites such as “MyCleanPC”, “MaxMySpeed” and “MaxMyPC” you may not realize how impossible the claim is that they are trying to make. These sites and similar ones like them (StopSign.com, DoubleMySpeed.com, etc) make extremely convenient-sounding promises. The commercials for these sites show people sternly warning you that if your computer is slow, it could indicate the presence of viruses, spyware, malware, trojans, adware, etc. Just as you’re getting worried, the person in the commercial assures you that with one easy click of said program (MyCleanPC, MaxMySpeed, MaxMyPC, whichever) your computer would be scanned and sped up, with some supposed users claiming speed increases of 100%! CyberDefender - Not to be trusted. And this is where it gets hazy for non-technical computer users. If you have ever had to remove a virus, clean up spyware, eliminate a trojan or get rid of adware , you will know full well how difficult this process is. Any real computer tech knows what a headache it can be to remove malicious software (malware, also known as badware). Malware programs – adware, spyware, trojans, viruses, worms – can be a nightmare to acquire and even worse to remove. These programs literally infect your computer software – some on a very deep level – with their malicious code. This can cause a variety of symptoms, but a very common characteristic is that your computer becomes really slow. Sometimes it takes forever for programs to open. Maybe your computer locks up, or you get tons of popups (or tons of popups cause it to move perform slowly or lock up). When your computer is slow due to a malware infection, it’s generally due to the processes the bad program is attempting to run in the background. These hog up your computer’s resources therefore it runs slowly. Sometimes the program will only run a few processes and it’s not too hard to find and stop them. Other times, there could be many background processes and they can be very difficult even to locate. No single program can clean up or prevent all infections. That’s right, you can have expensive anti-virus software, keep it updated at all times, and have real-time scanning enabled 24/7 – it still can’t protect you from everything. Likewise, if you were to get infected and run an antivirus or antispyware program to remove it, there is a chance it won’t work. Sometimes it does, sometimes it doesn’t. 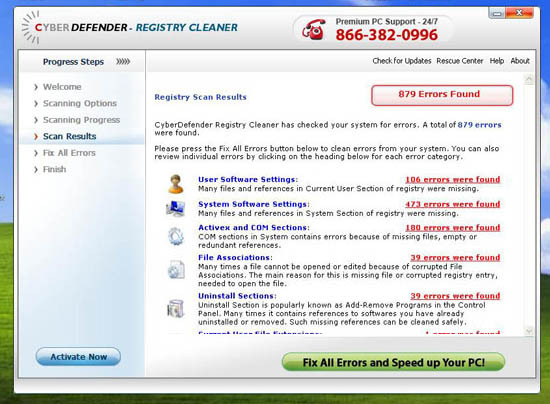 No antivirus or antispyware program can guarantee you perfect results every time. So when I hear those TV commercials making such preposterous claims, it is downright insulting to me as an experienced computer tech. The truth is, any program like this is almost guaranteed to be malware itself. I’ve noticed that many flashy looking and heavily advertised antivirus and antispyware software programs are generally scams. Some of the best antivirus and antispyware (note both words are often used as catchall terms to describe anti-malware) programs are small, generally unadvertised, free programs. MyCleanPC, MaxMySpeed, StopSign, MaxMyPC – all of these programs offer a free scan – a scan that, when finished, will hound you for money. Once installed, it runs a scan. The scan shows a ridiculous number of “problems”. When you click “Clean”, “Fix” or “Remove”, you’re taken to the scamware’s website and told you must buy the product first. Let’s say you pay for one of these fake antivirus software products – other popular variations include CyberDefender, WinAntivirus Pro, Antivirus 20xx, ByteDefender, and XP Defender (note the similarity to legit Microsoft products and other legit antispyware programs) – it should at least do what it says if you pay for it, right? CyberDefender - After a scan. Well, you wouldn’t actually want it to work at that point. It’s almost paradoxical. If it worked, it would have to delete itself. If it did all but delete itself, it’d be deleting files you need. Scamware shows you “problems” that are actually legit files. If you aren’t familiar with the file names of the processes your computer normally runs, the list of file names is daunting. Several years ago a popular hoax email was convincing people to delete a file called “jdbgmgr.exe”. The file name didn’t appear to make sense and the icon for that file was a teddy bear. People were deleting that file left and right only to find out they made a mistake, it was part of the Windows Operating System (at the time). If the software is being advertised on a TV commercial, especially one that uses scare tactics (“If you’re computer is running slow, it could be riddled with VIRUSES! SPYWARE!”) it’s almost guaranteed to be bad. If the software makes it sound like it is simple and guaranteed to work (even if it isn’t stated, but is implied) then it’s almost guaranteed not to. If the software makes superior sounding claims that other reputable programs (Norton, McAfee, TrendMicro) do not make, you should be suspicious. Contrary to what you may think, some of the best software is advertised most via genuine word-of-mouth. If you find people suggesting it in the forums on MajorGeek.com, BleepingComputer.com, TechSupportGuy.org, TechSupportForum.com, or MalwareBytes.org then you’re probably safe, especially if you see it recommended many times over. If you aren’t sure, always remember – you can’t pay for advertising with a free program, they have to be getting their money from somewhere. You don’t want to wait until it’s installed to find out how. This entry was posted in Beginner, General Techie, Intermediate, Troubleshooting and Help, Viruses, Spyware and Scams and tagged antispyware, antivirus, cleanup, comparing, fake, malware, problems, software, spyware, virus, virus removal. Bookmark the permalink. 4 Responses to MaxMySpeed? MaxMyPC? MyCleanPC? How about InfectMyPC! i made the mistake of running a free scan using maxmyspeed.com. even though i did not purchase anything and uninstalled it from my computer, the program is still running a scan every time i start up my computer. “maxmyspeed” still appears on my list of programs, but when i uninstall it again, i get a message that says it’s not installed. Hi Glenda, sorry my reply comes a few days after your post but let’s see if we can do something about this if you are still having issues. There are multiple different ways to get rid of these things and the easiest and best solution depends on your knowledge level and familiarity with Windows/computers. First I would download and install MalwareBytes (can be downloaded from Cnet by clicking here). Download this and then go into Safe Mode Without Networking and install and run a full system scan (this will take awhile – potentially hours!). You should be safe to remove anything it finds. If you reboot your computer back into Normal Mode, you should be fine, however to be safe, run MalwareBytes again in Normal Mode after your restart even if you don’t see anything wrong. If MalwareBytes gives your computer a clean bill of health then it wasn’t an awful infection and you should be fine. If not, more drastic steps may need to be taken. Some of these are easy to clean, others not so much.